Our specially designed long fluffy towel instantly absorbs any water and residual shampoo left on the hair after washing. This saves time spent on blow drying, lessening any damage to overheated hair follicles. Our towel can also be used on the entire body and is ideal for any skin type. Keep dry after each use. 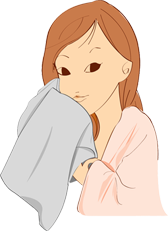 Care for your long towel by drying them after each use. Wash your long towel periodically with regular pH neutral detergents. This will help you preserve the life of your long towel.